Our Creative Caterpillars program focuses on the five components of Early Childhood development – Social, emotional, cognitive, fine motor and gross motor skills. By understanding and leveraging a child’s natural desire to comprehend the world around them, we are able to maximize their learning opportunities while keeping the process enjoyable. There is no one like your child! Every child’s development is unique and complex. Although children develop through a generally predictable sequence of steps and milestones, they may not proceed through these steps in the same way or at the same time. A child’s development is also greatly influenced by factors in his or her environment and the experiences he or she has. Three and four year-olds learn primarily through exploring, using all the senses. While playing, they are better able to ignore distractions and focus on the task at hand. They will even persist in completing something that is a bit difficult and can think more creatively and methodically when solving problems. Development of independence is fine-tuned as children become more self-reliant and are able to “do it themselves”. This is done through life skills such as pouring their own juice, cleaning up after an art project and taking care of their own things. Social skills play a big part in our three and four year old program as our caring and warm staff are always there to give children that extra big hug in the morning. Developing problem solving skills are incorporated into the daily routine as the children work on settling their differences, being a good share friend and making decisions as to which learning center to visit next. This program will serve three and four year olds. In order to work independently in this age group, children are taught the rules of the classroom and how to move and work successfully within it. Exercises in grace and courtesy are presented daily during “circle time” and in small informal group lessons. Our children learn how to behave correctly based on the situation and acquire the skills essential for everyday living. By helping the children learn independence, social skills (such as conflict resolution) and language skills they are able to engage positively in the classroom, community and beyond. Exercises in the area of sensory awareness help to develop skills in thinking, judging, concentrating, comparing and sequencing. The materials offer unlimited opportunities for the development of vocabulary and dexterity that will lead to writing and reading. The exercises in this area of study are designed to prepare our students for more complex learning in Language and Math. Language in A Joyful Noise Preschool curriculum focuses on oral and written language development. Our oral language curriculum is designed to meet young children’s innate need to acquire language. Significant emphasis is placed on building vocabulary and oral competency. Using a variety of materials, children acquire a rich vocabulary for labeling, describing, comparing and contrasting their environment and the people in it. Precise terminology is used. 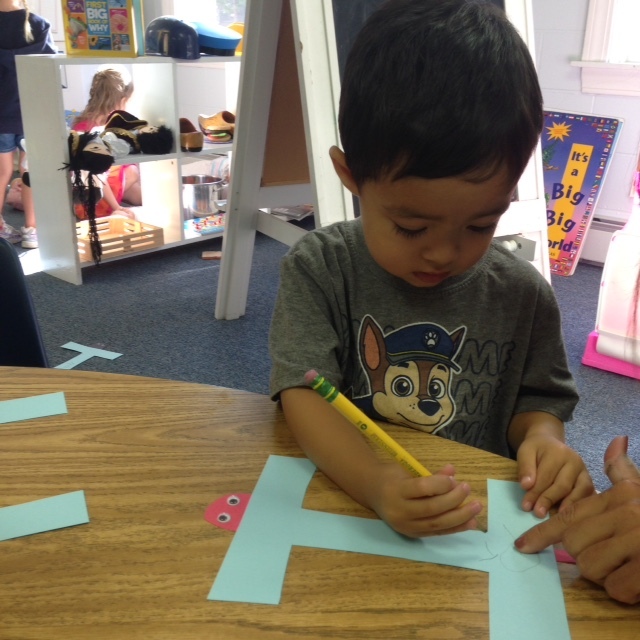 Once speech becomes acute and the basics are understood, children move on to letter recognition & reading. Literacy skills develop rapidly as the inner drive to learn motivates children and teachers provide the appropriate level of support to take advantage of this natural stage of heightened awareness. Our Math curriculum is firmly based on learning through experience. Children use a wide variety of carefully constructed materials which lead them to an understanding of the value and sequence of the numbers 1 to 10. From there they are introduced to larger numbers and the concept of grouping numbers into tens, hundreds and thousands. They may be introduced to the basic mathematic operations (addition, subtraction, multiplication and division) at a concrete level in real life scenarios to help them understand why these concepts are useful and what they really mean. Measuring, comparison, and patterns are incorporated into the student’s daily activities. Our Cultural Studies program is based on an integrated study of Science, Social Science and the Arts. Children first experience general rules of the universe, such as, the division of land and water, and gradually break them down into smaller parts, continents, oceans, countries, etc. Stories of animals and children from other lands help our students understand our fundamental needs and how these needs are influenced by climate, environment and lifestyle. Science experiments that demonstrate the properties of matter (sink/float, magnetic/non-magnetic, solid/liquid and living/non-living, etc…) are made by the children as part of the study of their environment. AJNP has a large gymnasium, a smaller indoor play room, an outside playground, walking trails and sports fields to encourage our youngest student’s large motor skill development. With tumbling mats, riding push toys, small basketball hoops, swings, a small climbing wall and exceptional teachers, each child will find his/her favorite activities and strengthen their natural propensity to active learning. All in all our Creative Caterpillars are building the social, physical and cognitive foundation so necessary for the more academic years to follow.